Pete is the professional you’re looking for to satisfy all your gardening needs. As a licensed building contractor for the City of Hamilton and a master contractor builder, Pete has loved design and renovation since he was young. His attention to detail and keen interest to satisfy every customer’s special needs are the secret ingredients to his Dream-to-Reality recipe. He admits that one of his flaws is being too much of a perfectionist, but he hopes that his friendliness will compensate for it. “Every customer is number one,” he says. Even if each member in the family has different needs. and your back pains are telling you shouldn’t shovel snow anymore? Not a problem! Give Dream Concepts a call and let’s figure out a plan! 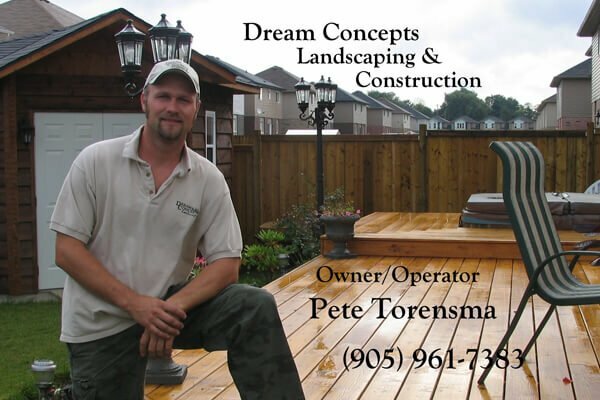 Dream Concepts has been servicing Stoney Creek, Burlington, Ancaster, Hamilton and their surrounding areas for eight years. So give them a call for a free estimate!